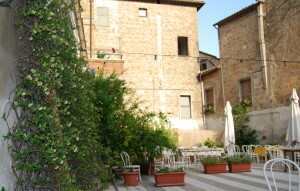 Chef Lorenzo’s patio garden. An inspiration! Last summer we had the opportunity to travel to Italy. It was all we had imagined and more. Every time we turned a new corner it was like a scene from a movie. The people were kind and gracious; the landscape breath-taking. Everywhere we turned flowers and herbs grew in nooks and crannies, pots and gardens. One particularly wonderful patio garden was Chef Lorenzo’s in Orvieto. Tucked down a small alley (the Italians would call it a street) off the main square in an historic stone building is his Zeppelin Ristorante. It was here that we got to cook with the chef. How amazing to learn to make Italian food in Italy with a famous chef. That just doesn’t happen every day! We started at the espresso bar, walked through the seating area and back into the kitchen. Oh, what a kitchen it was! There were eight of us, plus Chef Lorenzo and his sous chef, a student from America just finishing his 6-month internship in Italian cuisine. We made bread – the staff of life. We made zucchini blossom pizza. We learned to debone and stuff turkey thighs with sun dried tomatoes and fresh herbs. We made pasta with wild boar ragu. It all smelled so delicious and was truly an experience to eat this meal. Just outside the kitchen was a patio where there were containers of fresh herbs. When we needed parsley and basil for the pizza – we went outside to clip what we needed. Rosemary and thyme for the turkey mixture…back to the patio. The herb containers sat in the midst of hydrangeas and other flowers, making it a hidden oasis, and so very Italian. After 30-plus years of making dinner every night (that is more than 11,000 dinners, for those who are counting! ), I am so bored cooking the same things. Seeing how the Italians approach food gave me a much needed shot of inspiration and just the right amount of new and exciting that I could bring back home to my own humble kitchen. 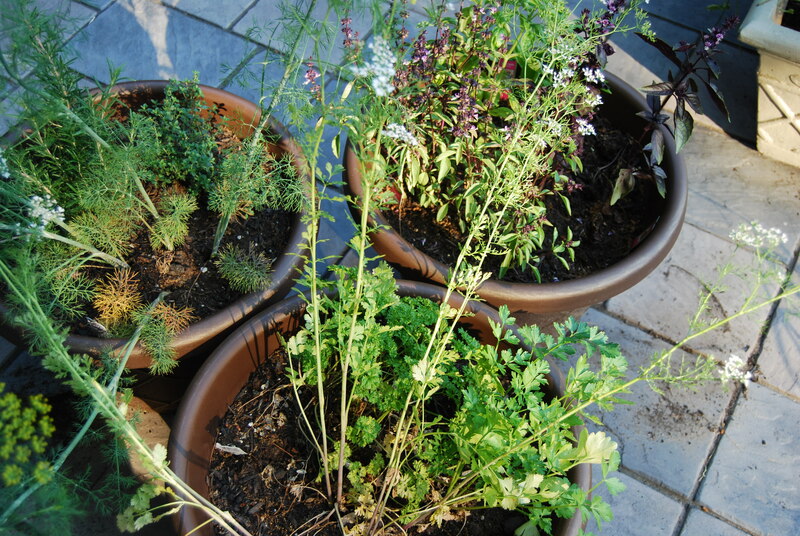 For Mother’s Day, my wonderful husband gave me a container herb garden on my own patio –with various parsleys, rosemary, sage, basils and dill. I’ve started using some of the herbs in dinners already. I am surprised by what I see growing in the containers. The Thai Basil and Cilantro now have flowers growing from their tops. I’ve never seen herbs actually grow – they’ve always just been in alphabetical order in little jars at the grocery store. So, after a quick google search, it appears that flowers on herb plants are pretty normal. In fact, herbs are often planted within flower gardens to complement more traditional flowers (who knew?!). When grown for cooking, you cut the stalk with the flowers and just use the leaves. (I think with further research, I’ll find how to use the flowering parts as well.) If you cut back just the top few leaves, the plant will continue to grow and will grow fuller throughout the summer. This led to another thought, and the topic for this article. I often look for comparisons when describing financial or retirement topics. When someone is unfamiliar with a topic, it’s best if we can find some common ground to start the discussions. It’s like that with retirement investments. When investing for retirement, most Boomers tend to understand that having some of their money in growth stocks or growth mutual funds offers them the potential for increasing their savings. There is a lot of information available about what stock funds are designed to do, how they work, how to choose them and so forth. We tend to have these investments in our retirement savings accounts, like 401(k)s, 403(b)s, IRAs and so forth. What I find interesting is that when leading-edge Boomers reach retirement, the tendency is to scale way back on their growth investments for more “conservative” ones. That could be a good idea, but for most Boomers, they need to be planning for a long retirement – 25, 30, 35 years or more – depending on their age at retirement and their general health history. That is a long time that their investments need to work to kick off income. Then, why do so many Boomers make big changes in their investment strategies when they get ready to retire? My opinion is that it’s a combination of insufficient knowledge and lack of adequate planning. Thankfully, both are easy to fix. If you keep in mind that investing in stocks is for long-term goals, and “long-term” is typically defined as 7 to 10 years or more into the future, your retirement is a long-term investment. At least until you are 95 or so! Think about your growth investments like those herbs in the container. Your container is your retirement account. You wouldn’t just strip the dill or the basil plant bare. You take what you need in a measured way and let the plant regenerate and grow again. It’s the same with your retirement investments. You keep some of the growth investments in the container. Make a plan for what you need, take a little at a time (I avoided using “thyme” right here), and let your accounts regenerate when the market is moving up. One practical way for growing your retirement assets is to put different investments in different “containers”. 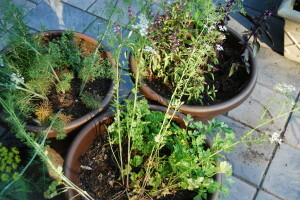 (The parsley in one container, the basils in another, etc.) For immediate cash flow, you’d have your spending or cash container (i.e., checking account). For income needs 2 – 5 years out, you would have a short-term investing container with more conservative investments (i.e., CDs, bond funds, fixed-income investments). And, to provide growth to keep your assets working for the long haul, your growth container would have equity investments that you don’t plan on tapping for 6, 7, or 10 more years. We can all learn a considerable amount about growing your retirement assets from our gardens, from some really good retirement planning and from a fabulous Italian chef named Lorenzo! You can also share your herbs and other fresh produce from your garden at your local food pantry. Check out: Garden Writers Association for Plant a Row for the Hungry. « The Retirement Kitchen: Inflation Will Melt Away Your Retirement Savings like Ice Cream on a Summer Day!